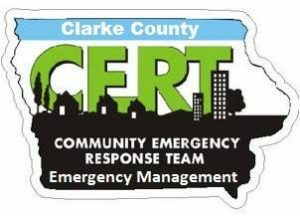 Going on 7 years of Service, the Clarke County CERT organization is a pool of volunteers who have joined together and have been educated about disaster preparedness for hazards that may impact the area they live in. They have been trained in basic disaster response skills and are able to give support to the emergency response agencies in their area. CERT volunteers are trained to give critical support to their family, loved ones, neighbors, and co-workers until help arrives. CERT is an integral part of Citizen Corps, the grass-roots movement that actively involves everyone in making our communities and our nation safer, stronger, and better prepared. All over America, communities have organized Citizen Corps Councils to inspire people to take action and get involved. To learn more about CERT and other Citizen Corps programs in your area, visit https://www.fema.gov/community-emergency-response-teams. Under the direction of local emergency responders, CERT teams help provide critical support by giving immediate assistance to victims, providing damage assessment information, and organizing other volunteers at a disaster site. Volunteers trained in CERT also offer a potential workforce for performing duties such as shelter support, crowd control, and evacuation. The role of a CERT volunteer is to help others until emergency personnel arrive. In addition to supporting emergency responders during a disaster, the CERT program builds strong working relationships between emergency responders and the people they serve. CERT teams also help the community year-round by helping with community emergency plans, neighborhood exercises, preparedness outreach, fire safety education, and workplace safety. In Clarke County, you may see us directing traffic at various running events and during most parades. You may also see us assisting with training events for the various responders. We would love to train you. If you feel that this is something you would like to learn and give critical support to first responders, provide immediate assistance to victims, and organize spontaneous volunteers at a disaster site contact us. 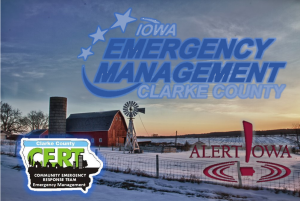 Alert Iowa is a statewide mass notification and emergency messaging system. The system can be used by state and local authorities to quickly disseminate emergency information to residents in counties that utilize the system. Alert Iowa will allow citizens to sign up for the types of alerts they would like to receive. Messages can be issued via landline or wireless phone, text messaging, email, FAX, TDD/TYY, and social media. Messages may contain photo, video and audio attachments to help subscribers better understand the situation at hand, or where to find additional information. For more information about Alert Iowa please visit the HSEMD site. Click here to sign up for Clarke County Alert Notification System. Clarke county is the final stages of flood mapping for the ENTIRE county. Please take a second to look at the links below for your address. Is the street name correct? Is there any other errors that you see? There will be only a 90 day appeal window to make any changes to this map before it becomes final — approx. Sept 2017. This will also have an effect on any mortgages, purposed buildings, and possibly your homeowners insurance. There are hard copies of this preliminary draft located in the Emergency management department in the courthouse. 641-342-6654. Please notify us with any changes or questions you may have.